The Montenegro international completed a £22million move to the Etihad Stadium from Fiorentina in July 2013 but scored only eight Premier League goals in an injury-interrupted two-season spell with the north-west giants. A tweet from Inter's official account on Sunday read: "@stevanj35 will arrive in Milan tomorrow before undergoing a medical on Tuesday." 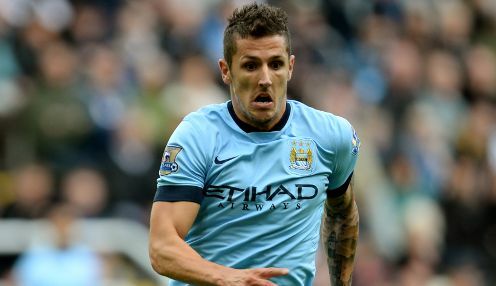 Dubbed the 'Montenegrin Messi', former Arsenal and Manchester United target Jovetic failed to live up to his high-profile billing and struggled for regular stars under manager Manuel Pellegrini. He managed just 11 goals in 43 games in all competitions for the former Premier League champions. He was also omitted from the club's 21-man squad for the knockout phase of the Champions League in February and is expected to sign a two-year loan deal to join Nerazzurri. The recent arrivals of Ivory Coast powerhouse Wilfried Bony from Swansea and England forward Raheem Sterling from Liverpool have provided further competition for a place at the Etihad Stadium and the Milanese giants are poised to complete a deal for former Mladost Podgorica and Partizan Belgrade star Jovetic to join coach Roberto Mancini's new-look squad at Stadio Giuseppe Meazza. The Italian has made no secret of his desire to improve on a disappointing eighth-place finish in Serie A last season and has already brought in the likes of Geoffrey Kondogbia, Martin Montoya, Miranda and Jeison Murillo over the summer. Inter Milan are currently priced 1/1 to secure a top-three finish in Italy's Serie A next season.